I painted my stepdaughter's room in a very similar color... mine was Sherwin Williams' "Peppercorn." It turned out dramatic and stunning. I painted the trim bright white and her accents are purple, fuchsia and chartreuse. Beautiful wall color - What color and brand is the paint on the wall? It's lovely! Thanks. I'm going to say it's elephant gray. 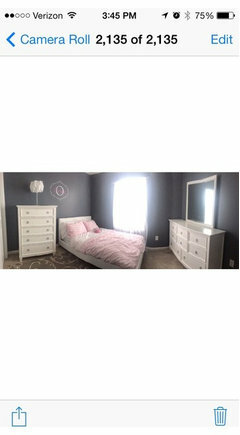 I painted my daughters room that color, or a shade above it. I'm looking at the sherwin Williams sample of Peppercorn. I think it looks similar. Is that desk from West Elm? And where did you find the massive cork board? Cushions? If you mean the bed pillows, the purple/lavender throw pillow is custom and the sheets from a discount retailer (TJ Maxx). Hi Dayka, Can you tell me where I can get this fabric, or I can buy through you? Love your design with pattern and colors. Very talented. Vision board - I love the vision board. I am making my own, and would like to know how this one is made (fabric, foam etc) or where it has been bought? Thanks! This one was purchased from Home Goods (I added the nailhead trim), however there are lots of great tutorials on the web for making your own, especially if you need an oversized board. Homasote is a great product to use and you can wrap it in the fabric of your choice and add wood framing around the edges to up the ante. Search the web then hit your local Home Depot or Lowe's building department for supplies. Good luck! I just found a couple really cute boards at Kirklands, similar to a Home Goods. Light - Where is the desk light from? Thanks! The desk is from West Elm. I just purchased it as a bedside table for FL home and use it as a desk when there. It looks fabulous and is high quality! Love it! Can I mixed the cheveron pattern duvet with a ikat pattern pillow? You certainly can. Dayka is absolutely correct. Purple and grey pillow - What fabric is on the pillow? Pillow? - Where is the purple pillow from? Clever WorkspacesThere is nothing quite so sleek and simple as the parson's desk. But it can be a bit cramped. Lean a giant bulletin board against the wall and increase your surface space. This setup takes a similar tack. Trimming out the bulletin board with molding helps it to feel like a thoughtful part of the design rather than an incidental. Work With What You HaveOnce you’ve found a place that feels good to you and allows you to be productive, work with what you have. Don’t let the lack of a traditional office space get in your way. A desk can be slid under a window or tucked behind a sofa.Or you can put a desk beside a bed as a nightstand or getting-things-done stand. Consider multipurpose furniture. If you’re working with a really limited space, you may want to use your desk as a bedside table. This can be risky in terms of the two parts of your life merging, however. Small things you can do to help include closing your laptop or turning off your computer when you’re done, and removing all papers and work-related items until you use it as a workspace again. I love the use of a corkboard as an inspiration board too.